I’d like to begin our update by quickly reflecting on the 2013/14 season, which finished up in early June for the club. Our final match took place on Friday June 6th at Richmond Park in Inchicore, where CY’s senior side faced League of Ireland champions and namesake St Patrick’s Athletic in the 2nd round of the FAI Senior cup. The game ended 3-0 to the hosts, with the pick of goals coming from former Irish international Keith Fahey, who scored a fantastic second half goal to put Liam Buckley’s side in command. It was a strong performance from CY in front of an attendance of around 800 spectators. Our senior team ended a tough league campaign in sixth place, a fantastic achievement considering we spent most of the season staring relegation in the face. Two semi-final appearances in both the Intermediate and Metropolitan cups topped off what was a solid season in the end. Unfortunately our Saturday side were relegated from the top division and will now compete in Major 1 Saturday next season. So on to the future; pre-season began on July 3rd and will continue apace until the new campaign for both sides reconvenes in mid-August. In the meantime, the club will embark on a thorough series of friendly matches, while also competing in the Noel Fox tournament, which takes place in late July. The Y will be hoping to add to its record haul of wins in this great competition; as always new players are more than welcome. We would encourage all players from our catchment area to play at the highest level in the amateur game, which St Patrick’s CY provide, plying our trade in the top Intermediate division. As always, we continue to drive the club forward with promotional events while looking for new ways to keep the club’s much-needed financing strong. 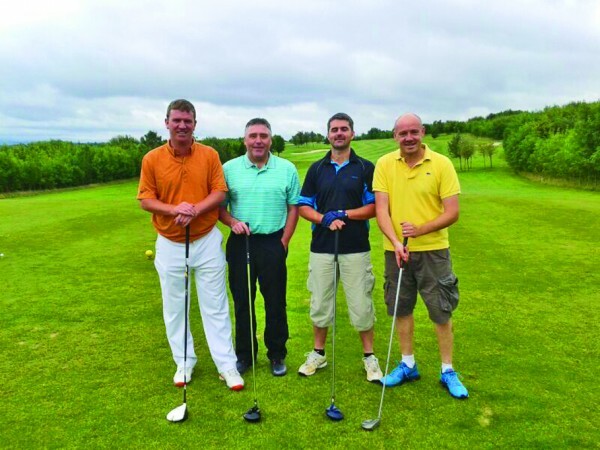 We recently held our annual golf classic at Millicent in Clane; the event was a great success with 40 participants, who helped raise much-needed funds for the club. A big thank you to all who took part and congratulations to the winning team of Ed Saul, Paul Flood, Paul Andrews and Stewart O’Connor (pictured). We would also like to take this opportunity to announce our new partnership with The Irishtown House. The club previously spent the best part of 20 years with this well-known watering hole and we are delighted to return for the coming season and beyond! This means we end our relationship with The Shipwright, and would like to sincerely thank Peter and the gang for some great times over the past three years. Finally, we end with the terrible news of the recent passing of former player Paul Behan. Paul played for CY’s league winning DDSL under 18 side back in 2006 and went on to play for the club’s first team. Paul had battled illness bravely and with great dignity over the past 18 months and he is a devastating loss to his family and friends. Our thoughts and prayers are with his father John and family, along with his extended family and friends who gave him a fitting send off, may he rest in peace.